NMASLA’s first ever Complete Streets Advocacy Day was a complete success, in spite of snow, rain, and sleet! We walked, we biked, we rode the train. We advocated for Complete Streets in New Mexico. We learned about important advances for Complete Streets in Santa Fe. NMASLA members were joined by ACE Leadership High School students and faculty and members of the New Mexico Complete Streets Leadership Team in our efforts to raise awareness of the need for planning and design with Complete Streets principles. 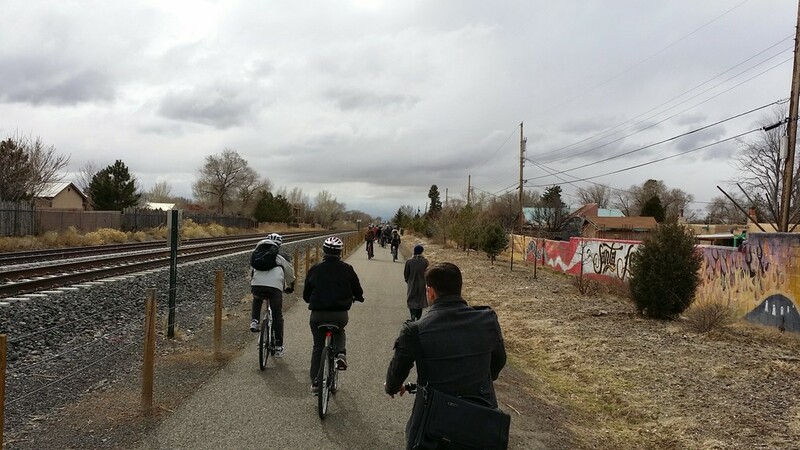 Albuquerque participants met at the Los Ranchos Railrunner Express Station, where we shared dismay at the coincidental yet timely Albuquerque Journal front page article highlighting news that New Mexico is ranked second in the nation for bicyclist fatalities per capita. Upon our arrival in Santa Fe, Claudia Horn of Design Office and representatives from the Santa Fe MPO filled us in on progress made in the development of the Santa Fe Metropolitan Pedestrian Master Plan. Claudia distributed worksheets and instructions for completing ‘walk audits’ (documentation of the pedestrian experience) that we would perform throughout the day. The information gained from these audits will help inform the Pedestrian Master Plan. At the Roundhouse, we met personally with a number of senators, who were generous with their time and supportive of the Complete Streets cause. We distributed Complete Streets and NMASLA Advocacy Handouts to legislators’ offices throughout the Roundhouse, and also left information at the Governor’s office. We learned firsthand about the chaos of the legislature ‘in session’, but also found that our public representatives were willing to hear our concerns and suggestions. The talented bicycle aficionados at Routes Bicycle Rentals set up our rental bicycles along the steps of the Roundhouse and skillfully helped us adjust bike seats and helmets. The illustrious Tim Rogers, of Active Transportation Planning, led our bike tour, providing us with a firsthand experience of recent Santa Fe Complete Street upgrades and important insight into critical considerations for Complete Streets planning and design. For details on our fabulous bike tour, visit http://www.sfct.org/trails/sfct-trail-events-in-2015/nmasla-complete-streets-bike-tour. We stopped for lunch and libations at the tasty Second Street Brewery (on Second Street) and braved snow and sleet as we cruised back to the Railyard. Once back at the City Railyard offices, we settled in for some thought-provoking presentations on Complete Streets related topics. Richard MacPherson of City of Santa Fe Long Range Planning, presented on design visions for a make-over of St. Michael’s Drive. Tim Rogers provided an overview of his Active Transportation Toolkit, a highly valuable Complete Streets planning resource that he created on behalf of the New Mexico Department of Health’s Healthy Kids New Mexico program. Wrapping up our presentations, Chrissy Scarpitti of Surroundings reported on the redesign that is underway for the Sheridan Downtown Transit Center in Santa Fe. Our minds brimming with the possibilities for safer and more accessible streets in New Mexico, we boarded the train back to Albuquerque, and enjoyed the satisfying exhaustion of an enjoyable and activity packed day. Many thanks to our generous sponsors, Envall Associates/Landscape Forms and Ewing for their help in the provision of funds for our train tickets, delicious lunch at the Second Street Brewery, and bicycle rentals! NMASLA also received an Advocacy Grant from National ASLA, which made this fun and informative event possible. A slideshow from the event, along with resources are included below. We'll see you in June for our Q2 event!